For his son, see William E. Boeing Jr.
William Edward Boeing (/ˈboʊɪŋ/; October 1, 1881 – September 28, 1956) was an American aviation pioneer who founded The Boeing Company in 1916. William Boeing was born in Detroit, Michigan, to Marie M. Ortmann, from Vienna, Austria, and Wilhelm Böing (1846–1890) from Hohenlimburg, Germany. From a successful family, Wilhelm Böing emigrated to the United States in 1868 and initially worked as a laborer. His move to America was not popular with his father and he received no financial support. He later made a fortune from North Woods timber lands and iron ore mineral rights on the Mesabi Range of Minnesota, north of Lake Superior. In 1890, at age eight, the younger Boeing lost his father to influenza, and his mother soon remarried. He attended school in Europe at Vevey, Switzerland, and returned to the U.S. for a year of prep school in Boston. He enrolled at Yale University in New Haven, Connecticut. He left Yale in 1903 before graduating to go into the lumber business. Boeing moved to the Pacific Northwest at Hoquiam, Washington, and purchased extensive timberlands around Grays Harbor on the Pacific (west) side of the Olympic Peninsula and also bought into lumber operations. He made a success of the venture, in part by shipping lumber to the East Coast via the new Panama Canal, generating funds that he would later apply to a very different business. 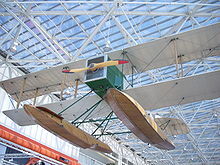 While president of Greenwood Timber Company, Boeing, who had experimented with boat design, traveled to Seattle, where, during the Alaska-Yukon-Pacific Exposition in 1909, he saw a manned flying machine for the first time and became fascinated with aircraft. Boeing decided to take lessons at the Glenn L. Martin Flying School in Los Angeles and he purchased one of Martin's planes. Martin pilot James Floyd Smith traveled to Seattle to assemble Boeing's new Martin TA hydroaeroplane and continue to teach its owner to fly. Huge crates arrived by train, and Smith assembled the plane in a tent hangar erected on the shore of Lake Union. 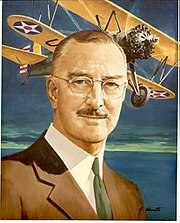 William Boeing became a pilot. Boeing's test pilot, Herb Munter, soon damaged the plane. When he was told by Martin that replacement parts would not become available for months, Boeing told his friend Cdr. George Conrad Westervelt (USN), "We could build a better plane ourselves and build it faster". Westervelt agreed. They soon built and flew the B & W Seaplane, an amphibian biplane that had outstanding performance. Boeing decided to go into the aircraft business and bought an old boat works on the Duwamish River near Seattle for his factory. In 1916, Boeing went into business with George Conrad Westervelt as "B & W" and founded the Pacific Aero Products Co. The company's first plane was the Boeing Model 1 (B & W Seaplane). When America entered the First World War on April 8, 1917, a little more than a month later, Boeing changed the name from Pacific Aero Products Co. to Boeing Airplane Company and obtained orders from the U.S. Navy for 50 planes. At the end of the war, Boeing began to concentrate on commercial aircraft. He secured contracts to supply airmail service, and built a successful airmail operation and later passenger service that evolved into United Airlines. In 1921, Boeing married Bertha Marie Potter Paschall (1891-1977). She had previously been married to Nathaniel Paschall, a real estate broker with whom she had two sons, Nathaniel "Nat" Paschall Jr. and Cranston Paschall, and these two became Boeing's stepsons. The couple had a son of their own, William E. Boeing Jr. (1922–2015). The stepsons went into aviation manufacturing as a career. Nat Paschall was a sales manager for competitor Douglas Aircraft, later McDonnell Douglas. Bill Jr. became a noted private pilot and industrial real estate developer. Bertha Potter Paschall Boeing was the daughter of Howard Cranston Potter and Alice Kershaw Potter. Through her father, Bertha was a descendant of merchant bankers Alexander Brown of Baltimore, James Brown and Brown's son-in-law and partner Howard Potter of New York; and through her mother, the granddaughter of Charles James Kershaw and Mary Leavenworth Kershaw (a descendant of Henry Leavenworth). The name Boeing came from German Böing and had Welsh origins as a patronymic from Owen. The prefix and suffix were included later. In 1929, Boeing joined with Frederick Rentschler of Pratt & Whitney to form United Aircraft and Transport Corporation. The new grouping was a vertically integrated company with interests in all aspects of aviation, intending to serve all aviation markets. In a short time, it bought a host of small airlines, merging them with Boeing's pioneering airline under a holding company, United Air Lines. He began investing most of his time in his horses in 1937. Boeing Airplane Company, though a major manufacturer in a fragmented industry, did not really become successful until the beginning of World War II. Between 1935 and 1944, William Boeing and his wife Bertha set aside a large tract of land north of the Seattle city limits for subdivision, including the future communities of Richmond Beach, Richmond Heights, Innis Arden, Blue Ridge and Shoreview. The Boeings placed racially restrictive covenants on their land to enforce segregation, forbidding properties from being "sold, conveyed, rented, or leased in whole or in part to any person not of the White or Caucasian race." Non-whites could only occupy a property on the land if they were employed as a domestic servant "by a person of the White or Caucasian race." Boeing retired from the aircraft industry. He then spent the remainder of his life in property development and thoroughbred horse breeding. Concerned about the possibility of World War II battles in the Pacific Northwest, he purchased a 650-acre (260 ha) farm in the countryside east of Seattle, which he dubbed "Aldarra". The estate remained in the family until most of the land was sold and developed into a golf course in 2001. Several acres, however, remained in the family, including the Boeing's own and two smaller houses. His primary residence for most of his life, however, was a mansion in The Highlands community close to Seattle; the William E. Boeing House was later listed on the National Register of Historic Places. Boeing Creek running near this property bears his name. William Boeing died on September 28, 1956, at the age of 74, just three days before his 75th birthday. He was pronounced dead on arrival at the Seattle Yacht Club, having had a heart attack aboard his yacht in Puget Sound, Washington. His ashes were scattered off the coast of British Columbia, where he spent much of his time sailing the Taconite, his yacht. He was posthumously inducted into the Aviation Hall of Fame in Dayton, Ohio, in 1966. In 1984, Boeing was inducted into the International Air & Space Hall of Fame at the San Diego Air & Space Museum. ^ a b c "Biography of William E. Boeing" (PDF). Boeing. ^ a b c Schultz, John; Wilma, David (December 21, 2006). "Boeing, William Edward (1881-1956)". HistoryLink. Retrieved July 10, 2017. ^ From the PBS documentary "Pioneers in Aviation: The Race for the Moon Episode I; The Early Years"
^ a b Schefke, Brian. "William Edward Boeing." In Immigrant Entrepreneurship: German-American Business Biographies, 1720 to the Present, vol. 4, edited by Jeffrey Fear. German Historical Institute. Last modified June 3, 2016. ^ a b Gates, Dominic (January 8, 2015). "Bill Boeing Jr., son of jetmaker's founder, dies at 92". Seattle Times. Retrieved July 10, 2017. ^ "William Edward "Bill" Boeing, Jr". Find a Grave. Retrieved July 10, 2017. ^ a b Taylor, Dorceta E. (2014). Toxic Communities. New York: New York University Press. p. 203. ISBN 978-1-479-86178-1. ^ Turnbull, Lornet (June 3, 2005). "Homeowners find records still hold blot of racism". The Seattle Times. Retrieved April 15, 2016. ^ Raley, Dan (April 23, 2001). "From The Bunkers: It's an exclusive: Aldarra opens on May 4". Seattle Post-Intelligencer. ^ "William E. Boeing House". National Park Service. Retrieved August 23, 2017. ^ "William Boeing, Plane Pioneer, 74. Founder of Coast Concern Dies at 74. Guggenheim Award Winner in '34". New York Times. Associated Press. September 29, 1956. Retrieved June 30, 2009. William E. Boeing, founder of the company that now makes this country's biggest jet bombers, died unexpectedly today aboard his yacht. He was 74 years old. ^ "Founder dies". Spokesman-Review. (Spokane, Washington). Associated Press. September 29, 1956. p. 1. ^ "Executive Biography of William E. Boeing". Boeing. Retrieved August 23, 2017. William E. Boeing died September 28, 1956, aboard the Taconite. ...his family scattered his ashes into the sea off the coast of British Columbia where he had spent so many months aboard the Taconite. This page was last edited on 18 March 2019, at 08:27 (UTC).